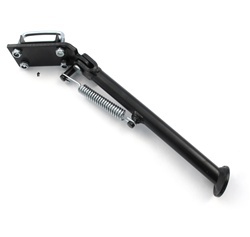 tomos BLACK side kickstand left side mounting for SQUARE swing arms - 9"
this is a moped side kick stand. it mounts on the left side. and is for square swing arms but use it on whatevs.. its for a tomos but has tons of other applications! will mount on lots of different swing arms. uses two u bolts for mounting. The bracket is too small to mount on the Streetmate's large swing arm. Don't mount it there, instead use a dremel and cut the welds to remove the bracket and grind smooth. Once the bracket is off, remove the original kickstand. The long vertical kickstand mount has a small hole about 4" up. put a bolt into that and into one of the top holes on the kickstand (I used top right), Drill another hole that will line up with one of the bottom holes (I used bottom left) on the kickstand and this bracket fits perfectly. 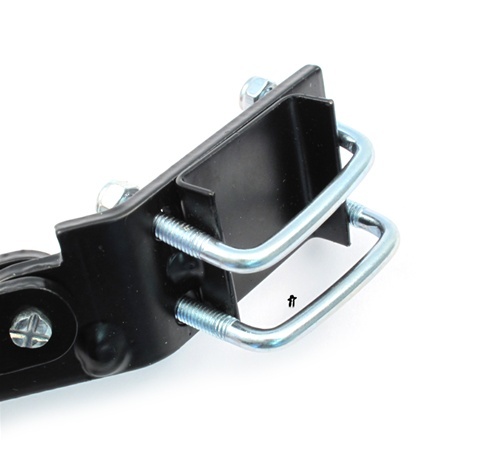 It will give your bike a healthy lean (not too much like if you mount it on the swingarm because it will mount about an inch and a half lower!) and it will feel more natural when kicking it down as it's in the same place on the left side of the bike that the old kickstand was on. It clears the tire by about 3/4" and looks sleek AF. Perfect fit for mounting it onto the old kickstand mount if you're into a little drilling and grinding. 1 hour of work time is enough. This kickstand is the cats meow! Not only can I take my turns sharper but, I get all the attention from the ladies now! It will boost your confidence ten fold! And I had not one issue bolting this up to my 10' sprint. Not one mod, it practically jumped out of the box, introduced itself, and threw itself on! Shortly after rading my fridge and screwingwith the cat. I'd give it ten tacos if I could! Oh ya! It must add horsepower because I was all of a sudden hitting 60mph!!! You want this, you need this, have you bought it yet??? 3 - cut the leg and lengthen by brazing in ~5" rod stock to lengthen it by ~1.5"
and now it fits and is awesome for trying to park on all sorts of ground. i worry it may be bending sometimes but it's still way stronger than the centrestand which always breaks under the weight of the streetmate. I keep the centrestand and use either one for different situations. Had to cut off the lower part of the C bracket to make a L Bracket. Now its on beautifully! I wish it was an inch longer leans very far down but its stable. lighter than the OEM middle kickstand. looks sick tho!!! I've suspected for years that with some minor modifications this would work perfect on my hobbit. Finally decided to snag one and after cutting off the c shaped piece and drilling a couple new holes more towards the center of the bracket my hobbit now has a kick stand. Here's a couple pics showing where I mounted it and how it looks.